Hello! It’s been already three weeks since the last update. I started replaying Cataclysm: DDA a few weeks ago to get some inspiration on how to implement the Fog of War system for Divided Kingdoms. I love how the game has implemented the FoW system to create so many memorable moments of gameplay. Wondering what lies ahead behind a door or a broken window, and then stepping in a room surrounded with powerful zombies. A smoker zombie unleashes a cloud of smoke, blinding you from seeing what’s happening around you. It makes the game so much more exciting. I want to do something similar for Divided Kingdoms. Unexplored tiles are completely invisible in the game area. All tiles are unexplored by default, on the world surface and in underground region instances. Explored tiles that are outside the player’s FoV have a shade of gray; NPCs and items disappear from the game area. 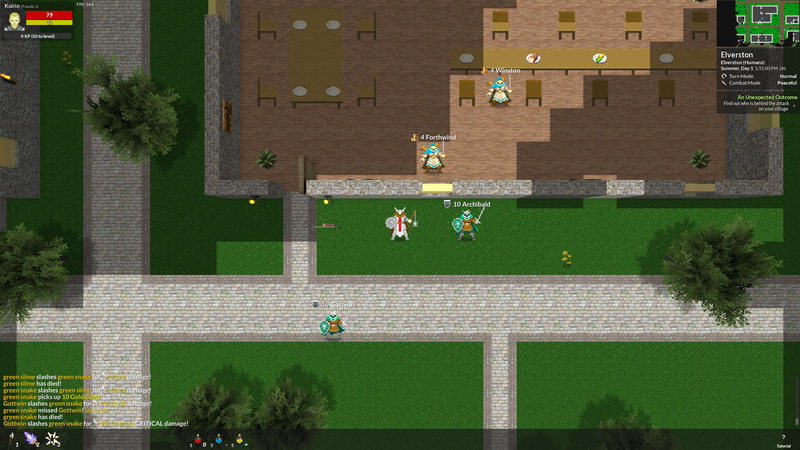 The player can hear sound effects and read conversation bubbles outside the player’s FoV, as long as the tile is in the visible game area. This can create interesting situations where you don’t know what’s behind a door, but you can have a hint of what’s behind by listening to the sound effects or seeing a conversation bubble pop up. Buildings have windows that can be seen through to give the player a peek of what’s happening inside. If a room inside a house has its door locked and the player has never seen inside the room, it will remain black. It’s a nice effect as it incites the player to try to see whatever is inside. I’ve been testing this for a few days now, and I feel like this is a massive improvement to the game. It improves the gameplay and the fun factor significantly. It still needs visual improvements, like animating the transition between FoW updates to make things a bit smoother. It also created problems with some of the shaders that I will fix later. The game is now using physics to animate the damage numbers. 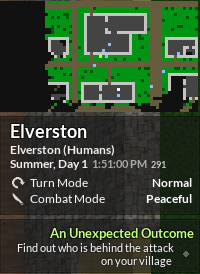 I wanted something more dynamic and fun for the player to watch. 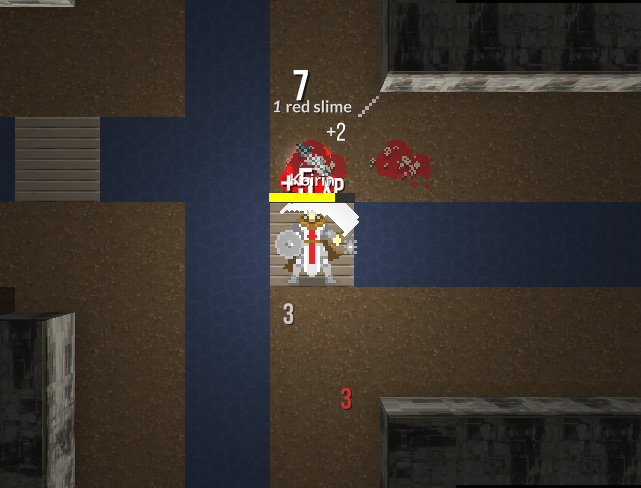 The damage numbers are using rigidbody physics to create a nice fountain-like animation of damage numbers. The damage numbers are now throttled slightly to make them more readable; sometimes numbers would end up being one over another. The direction of the falling numbers is in the opposite direction of the attacker, to give the player a clear idea where the damage comes from. Status effect-based damage, experience gain and other events are moving up above the player. I chose a new condensed bold font to display the damage numbers, with a shadow effect to make text more readable over any kind of background. Sprites can now be part of the text, so icons for elemental-based damage and status effects are shown besides the damage numbers. I also adjusted the hit feedback on the NPC sprite with a quicker and more obvious flash. Just that little change and new damage numbers made the combat much more satisfying and fun to watch! The minimap was part of the game before, but it needed optimization before being shown by default. 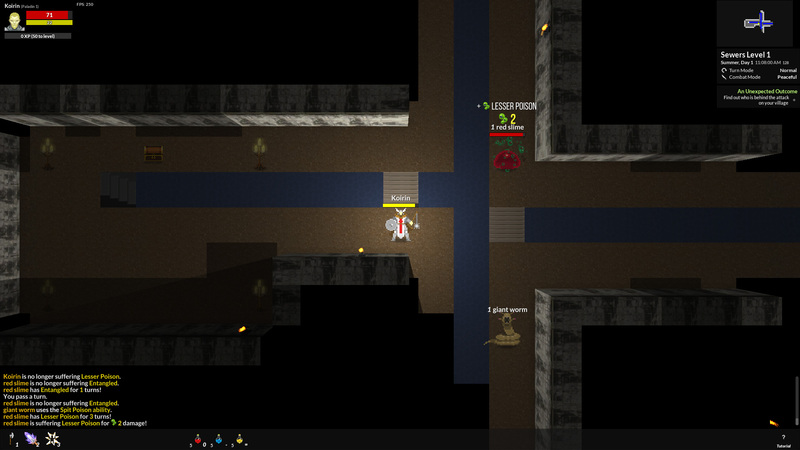 The controls are now shown on an overlay over the mini map. The minimap looks even better with Fog of War! Supported zoom types are from 1x to 4x (see GIF below). Hopefully the next few weeks will also be as productive! See you and take care!